I found some information was not registered correctly from itunes--- meaning the season/ep were wrong. Although was still an issue where no metadata was in the manger lib. I have one other library---- "Outer Limits 1963" that still has no metadata but series and eps seem okay. I may fix those so they are friendly to Emby. STNG has some similar issues, but not a big deal. Additional info: I noticed with series if one file is not read correctly, it can effect eps after or the entire season. Being a Software Engineer myself, I'm not sure if your code is "batch processing" items or thread based---- where conflicts with shared data of files can be troublesome. I have the "LOST" series; 120 eps. but only about 40 are actually showing in Emby. In 3.x it seemed okay. 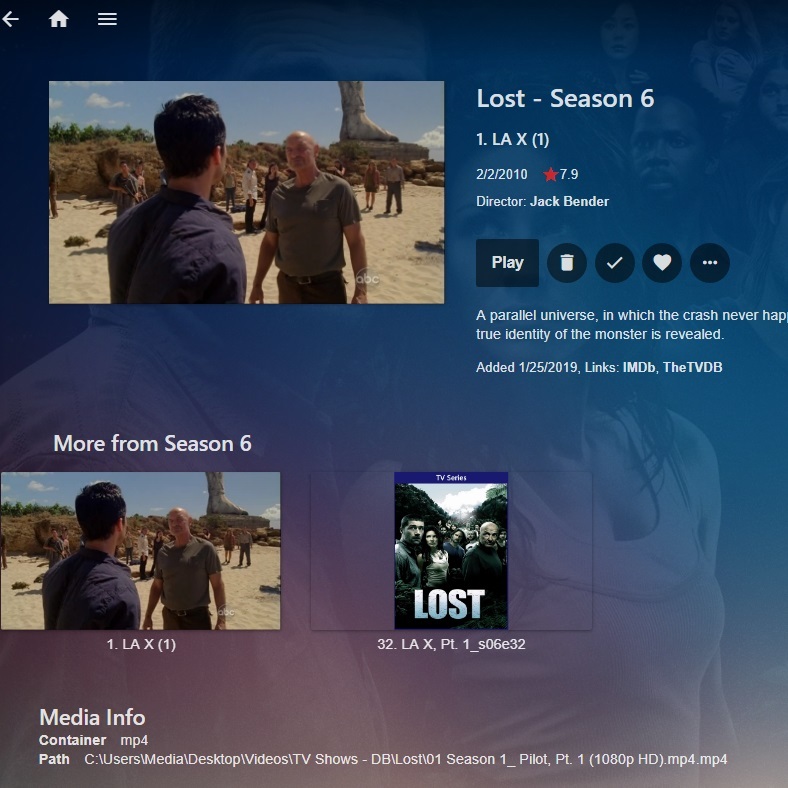 Alot of the IMDB info is wrong, but previously I fixed those manually, but now seasons and eps are just not displayed. They are not visible in the metadata library either. I've removed and put back the series but have the same results. Emby should read any usable video file and add it even if metadata is invalid or missing from other sources. Similar issue with STNG season 1---- 1 ep/but all eps show in metadata as ep 1 (manually fixable). hi there, can you please show us what the folder structure looks like? thanks. I can go change the season/ep format... these are just how they came out of iTunes. I don't understand this. What is that name suppose to represent? How did you set this up in Emby library setup? I have no idea how 3.x could have identified that naming scheme. Unless maybe embedded title vs filename. Even if it doesn't handle the naming scheme to determine season & episode numbers, the files should still show up. So that's what we want to get to the bottom of. 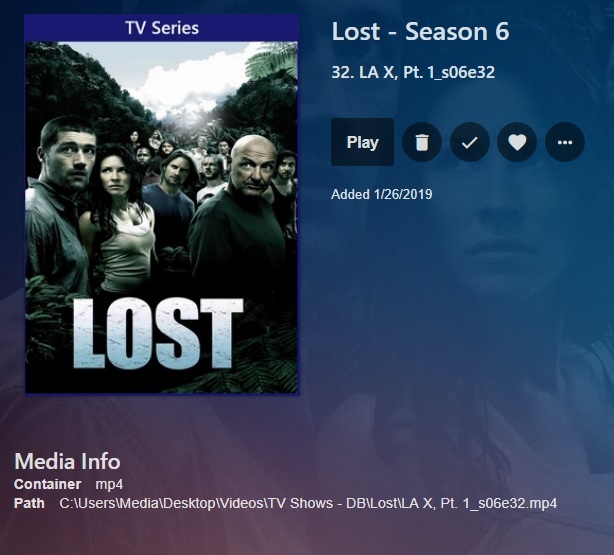 I added a folder called Lost with those two episode in it to a TV Shows library and the Series-Season-Episodes appeared but mis-identified as Season 6 episodes 1 and 2. Edited by Happy2Play, 25 January 2019 - 07:50 PM. However, that doesn't seem to work all time either unless its just taking IMDB info that's wrong. Should anything actually be showname in the examples in the wiki? I have never seen naming schemes like "LA X, Pt. 1_s06e32.mp4" or "01 Season 1_ Pilot, Pt. 1 (1080p HD).mp4". Emby does not use IMDB as a provider, but it can use a IMDBID on other providers. Yes it should be show name. Shows that have numbers in the title are going to be more difficult, as well as any numbers that appears before the season and episode numbers, such as the Pt. 1. Those are just difficult examples. But actually I tested this one, and it was parsed correctly. Yes this example appear to parse ok but unidentified. And for "01_ Pilot, Pt. 1 (1080p HD).mp4" it is identified as S06E01. @Happy2Play was that from running a scan, or the realtime monitor?